Life has gotten insanely busy as I have passed the “Three Weeks Until Graduation” mark this weekend. And when life gets busy, all I want to eat is comfort food. 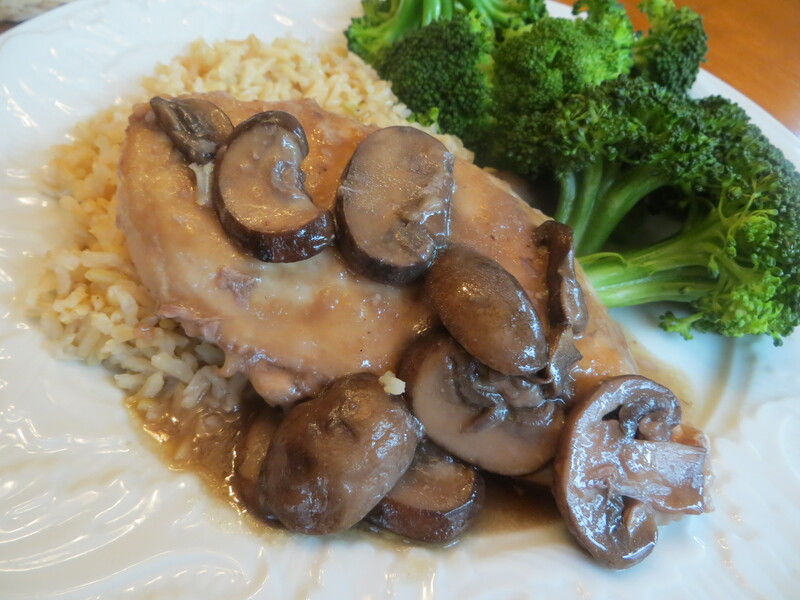 Nothing says comfort food like Chicken Marsala. It’s faux-sala because this chicken dish actually doesn’t have any marsala wine in it! We had mushrooms and chicken but didn’t have any of the deliciously sweet fortified wine… so we decided to substitute it with some good red wine spiked with simple syrup. It’s not exactly like the original dish but it tastes pretty awesome. This dish starts with a flour mixture. Flour, paprika, garlic powder, dried oregano, cayenne, salt, and pepper. It seems like a lot of ingredients, but this really is the only seasoning this dish has. Dredge six boneless, skinless chicken breast halves (that have been pounded thin) in the flour mixture. And pop them into a pan that has been heating over medium-high heat with some olive oil and butter in it. Cook the chicken for 3 minutes per side. Or until golden brown. Pull the chicken out of the pan and set aside. NOTE: the chicken is just brown on the outside AKA IT IS NOT FULLY COOKED. In the same skillet, add a little more olive oil and toss in the sliced mushrooms. Cook them until they are golden brown and delicious. We used cremini mushrooms here but the plain ole button mushrooms work too! When the mushrooms are brown and yummy, pour in the red wine, simple syrup, and chicken broth. Let the mixture come to a boil and reduce to thicken slightly – about 3 minutes. Stir the sauce occasionally too, making sure to scrape up the yummy brown bits from the bottom of the pan. When the mushroom sauce has reduced, place the chicken breasts back into the pan. Cook the chicken for 3-4 minutes per side or until it is completely cooked in the middle. Before serving, drizzle in some balsamic vinegar (for flavor) and a corn starch slurry (to thicken the sauce). Then taste everything and add additional salt and pepper if needed. We served ours over some brown rice but you can go traditional and serve it up over noodles. Whatever you choose, it’ll be divine (and oh so comforting!). 3 cups sliced mushrooms, button or cremini works great! In a plate, combine flour, paprika, garlic powder, cayenne pepper, oregano, salt, and pepper – stir to combine. Lightly dredge the chicken halves in the flour mixture and shake to remove any excess flour. In a large skillet, heat one tablespoon olive oil and butter over medium-high heat until very hot. Place the chicken halves in the skillet and cook until golden brown on each side – about 3 minutes per side. Remove chicken breasts from the skillet and set aside. Add in the remaining olive oil and add in the mushrooms. Cook until the mushrooms become golden brown and release their liquid. Pour in the wine, simple syrup, and chicken broth and bring the mixture to a boil. Cook for 3-4 minutes until the sauce reduces and thickens slightly. Place the chicken breasts back into the sauce and cook until they are cooked through, approximately 3-4 minutes per side. Add in the balsamic vinegar, any additional salt and pepper, and the cornstarch slurry. Cook until the sauce thickens. Serve immediately!